Tim, my silverback friend, was on his way to jury duty selection this morning and wanted to catch up on the injustices of the modern world over coffee before sitting in legal judgment of his fellow man. He works for the government now. That’s like a plumber w0rking next to a dripping faucet…drip, drip, drip. Eventually it wears a man down, when he does his job but those who won’t do theirs complain that he is showing them up by working too much. It would not surprise me if he gets transferred or fired to save the resident sloth population at his federal office. Accepting this reality is like drinking battery acid instead of coffee. I don’t like our bloated bureaucracy any more than the next guy. Still, I don’t believe I can change the course of a river; so, without liking it I tolerate it and put my energies where they may have a slight impact. I add the sugar of humor to balance out the battery acid aftertaste of modern life. Control is rarer than virgins in Vegas, and yet everyone seems to think it is possible in this crazy world to maintain control of larger groups of people or institutions. In a large church, school or organization, let’s say larger than 200 persons, forget it. “But we should be able to do this” cry the frustrated. Sure, we should but we don’t, and that’s life. Heck, try controlling someone in your own family for starters. Just start with your dog. I’m not sure it’s even our place to control others once they are over twelve. Influence? Sure, but the idea of control, I believe, is an outgrowth of fear. If you slap a man with a frozen fish, you’ll stop him from fishing for an hour. But if you break his fishing pole, you’ll stop him for most of a day. That’s control; all the work/coerci0n is on your side of the equation. You jack up the consequences to make the other person conform to your will… life as it should be. And the best controllers we call totalitarian dictators. We never seem to run out of these characters– Kim Young Fool in Korea or the Taliban at their latest post office box, Putin, China, Iran…. the ink smudges on the pages of history. Courts try to exercise control also. It’s the end game of behavior modification. I sat on a jury once. It was a drunk driving, eluding the police case. Seems two local brothers left the West End bar at 2:00 a.m. and drove dangerously toward the west, where they lived in a little rental cottage. Well, Officer Doright noticed their erratic driving and pursued. That’s when Dumb and Dumber went into speed up and evade mode. With a bit of a lead on the cop, they whipped into their trailer park/cottage enclave, slammed it into park and ran. The officer collared them and arrested the driver for DUI and evading police, maybe resisting arrest as well. Dumb’s defense was that he was not the driver; his brother was. The cop testified that Dumb, not Dumber, was the driver and pointed out the physiological differences between the two. Dumb was heavier and had little hair, whereas Dumber was thin and had a dirty mullet haircut. He had watched as they ran out of the car and noted who was behind the wheel of their uninspected vehicle with outdated registration. The officer showed the judge and jury photos of the chase path and the place of arrest. Dumb tried to say that the cop lost visual contact as they drove behind the dumpster across from their cottage, and therefore could not accurately identify the correct brother/driver. It was very lame courtroom drama. Dumb was not a very good criminal or a liar. His lawyer introduced Dumber as his client’s only witness. 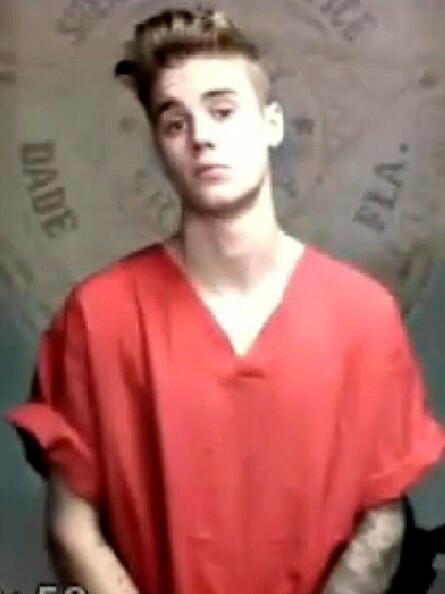 Skinny and hairy, Dumber shuffled in shackled and wearing an orange prison jumpsuit, looking a lot like Justin Bieber. He was sworn in and promptly and boldly lied, “I was driving.” No one believed him for a second. The district attorney asked him if he had a license. He replied, “No, lost it a few years ago.” Next question, “How did you lose your license?” ” A DUI”, he whispered. In fact, neither brother had a valid license due to previous DUI’s and both failed their sobriety tests. So, it really didn’t matter much to me– whoever was driving was drunk and guilty. There was no innocent man before the court. Slam dunk! Justice or Justin, as you will, is blind and deaf and dumb. In fact, there was no innocent man anywhere that day or any day. All of us are guilty of some crime or sin. Yep, I said that. I have to constantly remind my arrogant self that I am not a whit better than the rough edged folks who wander the streets of Turtle Town impaired. Because of my birthplace I am not an immigrant. Because of my education I am not ignorant. Because of a variety of factors I am not unemployed or living at the edge of poverty. Certainly there is personal responsibility involved, but how much free will does a lost hungry child have? We have all been hungry lost children at some point in our lives. .
We are left with that annoying drip, drip, drip of humanity. And we are mightily limited by our human nature. We can’t fix each other any more than my dog can do surgery on another dog. It is not in his nature. This is why perfect attempts at fixes are collectively called utopias, naïve attempts by golden retrievers to give pit bull terriers heart transplants. Caring about the hungry, thirsty, naked and imprisoned was a big deal for Jesus. He cautioned his followers to do just that, for among the poor and disadvantaged lives God the Father. Through his example, we can have our own spiritual hearts transformed– not by men or dogs or jails, but by God himself.